Yesterday while I was at work making a delivery in the parking lot of a busy village, I noticed a smattering of people heading towards a popular chain karate school. It was obvious they were students as they were already attired in gi-pants and t-shirts with the school logo. As I observed the class from the sidewalk there was a chief instructor barking commands while a couple of younger black belt sempai milled about and made corrections. It was a good mix of men and women at various stages of rank and fitness. Curiously, all the belts worn had a solid black stripe running down the middle. But what really caught my attention was the size of this adult class: about forty students! It was a sizable facility that could easily accommodate a large class. Most schools that I've trained in through the years weren't much bigger than a deli and I can fondly remember spirited sparring sessions where we would occasionally crash into neighboring matches. 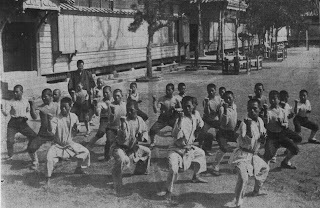 Originally, martial-art teachings were transmitted one-on-one. Later, the idea of group "lessons" emerged. Today, some schools have gone the way of syndication, offering courses in MMA, karate and cardio-kickboxing, complete with contracts and TV ads (geared mostly toward kids) with the hopes of attracting a mass following. Personally I like training in a decent-sized class where camaraderie can thrive - about a dozen people. More than that would likely dilute the quality of instruction, even if the sensei has helpers. If I'm running a class I make it a point to at least get everyone's name right. It seems to me that the bigger the class, the less personal it becomes for everyone. Do you prefer to train in large groups or smaller settings? I definitely prefer a smaller group; the instructor-to-student ratio is important to me. I think 15-20 is probably a good limit. My current school has about 15 students total; my old school had a larger student body but classes usually maxed out at 15-20. Within that size, you can find camaraderie but also can get some variety in training partners. I like smaller groups for regular training. Seminars are a good way to mingle and training with others from different styles. John Vesia posted: "Do you prefer to train in large groups or smaller settings?" I believe that in order to convey a true sense of the way and to achieve the exacting and traditional way of conveying knowledge of the arts as a way one must be able to do so on a one-to-one basis. Therefore, in order to achieve that goal I believe having more than four or five students max is an opening to less than the way. p.s. : This does not mean that those who choose that way are not worthy for I firmly believe, "All bottles are good!" Small groups if at all possible. For an instructor to adequately teach technical details to each member of a large group is all but impossible. Personally, I am convinced that this is part of what happened to karate when it first made the transition to mainland Japan; that is, I think Funakoshi found himself teaching so many people at once that he was left with no choice but to stick to the absolute basics. Fortunately for him, the Japanese are so devoted to mastering the basics of just about anything they do that this seems to have suited them just fine! On the other hand, sometimes you just have no choice. Years and years ago, when Lou Angel came to Tulsa to teach Goju Ryu, he was the only act in town, so to speak; anyone who wanted to learn karate had to learn from Lou, so I imagine that no one worried too much about how big the class was. I prefer a class of between about 8 and 12 people. large enough to get good variety of partners, small enough to get individual instrucction. We usually have about 12-15 students in a class. Though we do some 'whole class' training, particularly for kihon or kumite, we also break up into grade groups to practice kata or combinations on our own. Sensei comes around each group to give instruction/advice. It seems to work well and you usually leave the lesson feeling you've had a little bit of personal attention. I feel that the study of martial arts is intensely personal, and is best undertaken in small groups. I prefer a class size of between 8-10 for open hand, drills, self-defense etc. If we are working kobudo...a group of six is ideal due to space constraints. I think we all need some one-to-one time and guidance in training, and while small intimate groups are good for this I think maybe what's more important is the caliber of the students. Having some strong and inspiring seniors can make all the difference – especially since they're often the one's giving us one-to-one time. Maybe it's just that the standard is 'diluted' somewhat in some larger clubs. For me, whether it's 4 or 40 students, if the instruction is good and club standard high maybe size doesn't really matter that much after all. Just my thoughts. Small groups are best and one-on-one is fantastic for learning something entirely new. I definitely like the feel of a smaller group-no more than 8 I would say. It's more personal, less intimidating.